The guy who is managing your money … what’s he doing in the gold market right now? Because I’ll tell ya — way, way too many money managers are making a one-sided bet that gold will go down. Here’s a chart I snagged off my Bloomberg terminal. 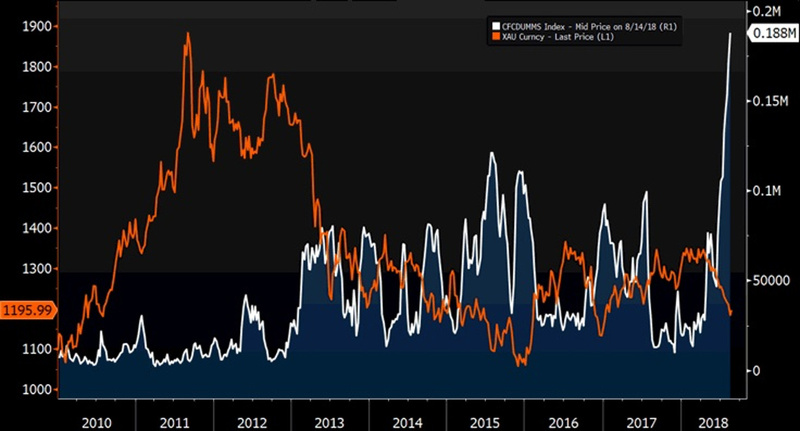 You’ll see the price of gold (in orange, the lower line) vs. the CFTC CMX Gold Managed Money Short Contracts (CFCDUMMS). Holy Cliff Diver, Batman! Through Aug. 17, the latest data available, those managed-money short contracts are at a historic high. And now you know why gold was so weak through last week. All those shorts were piling up against it. So, who is left to pile on now? That’s what the shorts should be asking themselves. Because if gold goes UP — rather than down as they’ve all bet — do you know what all those shorts will have to do? They’ll have to cover. And that’s when the number of short contracts will cliff-dive to a much lower level. Gold is under pressure, sure. It hit a 19-month low. But as I explained in my Aug. 21 column, gold ETF investors have already thrown in the towel. They’ve sold for 13 weeks straight. We’re at a point of maximum bearishness. And now, President Trump is talking down the dollar. He thinks the highty-mighty greenback is too strong. The strong buck is ruining his plans to bring more balance to America’s trade deficit. As the dollar goes lower, gold usually goes higher. And gold has been stretched so very, very fa-a-a-ar to the downside. We’re a long way from impeachment. And the truth is, a different unstoppable threat is about to unleash itself both on President Trump and the market. It could put stocks through the wringer and potentially send gold soaring like the safe haven we know and love it to be. So, I’d say those shorts are near a peak. After the peak comes the cliff-dive. And that — that could send gold on a rocket ride. My subscribers are busy placing their bets on how to ride the coming rally. If you’re doing this on your own, do your own due diligence. Where do you think this rally goes in gold?Did it start on this past Friday with the 20$ gain?